2000AD is a British anthology series featuring several different stories from different writers and artists in each issue. The company 2000AD has been around for over 40 years and is probably best known for introducing us to the character Judge Dredd and his violent futuristic world. This issue contains five stories that feature Judge Dredd, Jaegir, Sinister Dexter, Anderson, Psi-Division, and Strontium Dog, with a cover from Alex Ronald. The first story is the start of the new Dredd thriller “Judge Dredd: Flaws” and was written by T.C. Ellington, illustrated by Staz Johnson, colored by Abigail Bulmer, and lettered by Annie Parkhouse. Violence has erupted between two neighboring blocks in Mega-City One with opposing viewpoints on the current justice system, one side is pro-Judges and the other side feels let down by the Judges. Is the system flawed and where is Judge Dredd in all of the chaos? 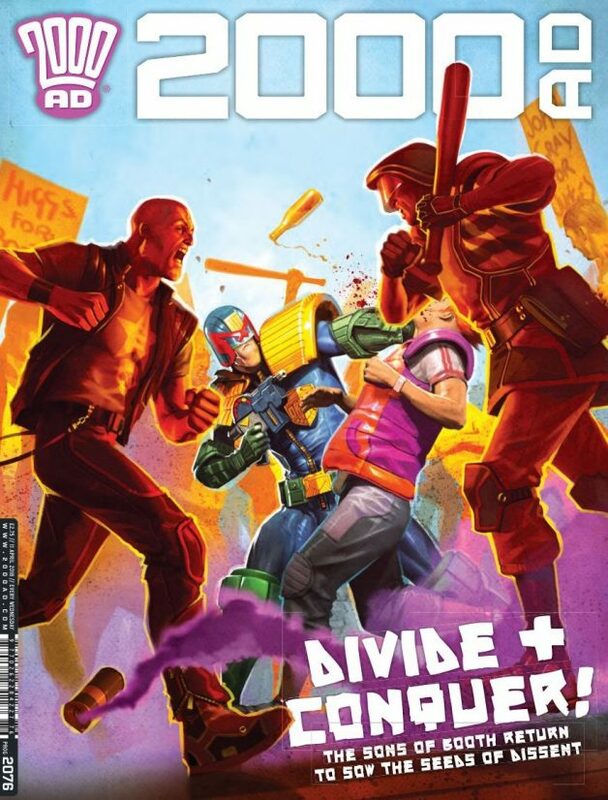 The story pulls some of the current social and political issues and plugs them into Dredd's futuristic society, looking at media exploitation for the sake of ratings, anger and division among the citizens, the police trying to maintain order, among other things. Like other artists that have been drawing Dredd, Johnson's art has a distinct look that has lately become the Judge Dredd style, which slightly resembles the major superhero comics. There isn't any action sequences, as the story is the major focus here. This is followed by “Jaegir: In the Realm of Pyrrhus Part 4” and was written by Gordon Rennie, art by Simon Coleby, colored by Len O'Grady, and lettered by Ellie De Ville. Jaeger is part of the Nordland State Security Police, sent on a mission with her team to Nu Earth where there is a war going on against Southern forces. In this part, the Madam-Facilitator of the Southern Cross Confederacy has arrived on Nu Earth to assess the success of the war in the current politically highlighted sector, but a Nort assault puts her in jeopardy. There is not as much action as in the previous parts of this story, but the pacing moves very quickly. As I've said previously, Coleby's art is terrific and filled with heavy black shading and intricate details. The colors from O'Grady have several pages filled with reds to show the change in lighting due to a red-alert status. While there wasn't as much action as before, this continues to be an excellent read. The third story is “Sinister Dexter: The Devil Don't Care Part 2” and was written by Dan Abnett, illustrated by Steve Yeowell, colored by John Charles, and lettered by Ellie de Ville. Sinister Dexter follows Finnigan Sinister and Ramone Dexter, the best hitman in the future city of Downlode. In this episode, Sinister and Dexter look to save the woman that put a contract out on them before the hitman gets to her first. We learn why Sinister and Dexter actually wants to stop him and are treated to a decent amount of action in this chapter. It ends with a sufficient cliffhanger that should leave readers looking forward to the next issue. I have warmed up to the slightly cartoonish art style, which fits the sort of dark comedy of the world that these characters exist in. After reading several stories about Sinister and Dexter, I'm actually looking forward to seeing what happens next. This is followed by “Anderson, Psi-Division: Undertow Part 4” and was written by Emma Beeby, illustrated by David Roach, colored by Jose Villarrubia, and lettered by Simon Bowland. Anderson is the top telepath (seen in the film Dredd) of the Psi-Division and is currently investigating the murder of another psi-Judge with her partner Judge Flowers. In this part, Anderson, Flowers, and the two potentially dangerous psi-operatives end up in a location that has calling all of the psi's. They encounter some serious danger and a potential new ally. The art from Roach resembles the style of the Judge Dredd tale, but there are far more horror and supernatural elements contained in this story. The final story is “Strontium Dog: The Son Part 4” and was written by John Wagner, illustrated by Carlos Ezquerra, and lettered by Ellie de Ville. Set in the future after the Strontium 90 fallout, Strontium Dog is a mutant bounty hunter that works for the Search/Destroy agency. He is currently on the Planet Protoz with a new hitman named Kenton, where the leaders of Protoz have presented them with a nearly impossible mission. Part 4 of the story sees Strontium head out on his own to find two fugitives who have bounties on them. Kenton is green and heads out looking for Strontium, not realizing that he may have put them both in danger. Once again, Strontium Dog is beautifully crafted by the legendary Ezquerra (co-creator of Judge Dredd and Strontium Dog) and the art is just rich in his unique look and style. If you like sci-fi and futuristic stories then you really should begin reading 2000AD. With multiple tales in each issue, there's always little bit of something to appeal to everyone.